The South Dakota Supreme Court has denied a request to hear an appeal in a case involving the controversial federal immigrant-investor program known as EB-5. 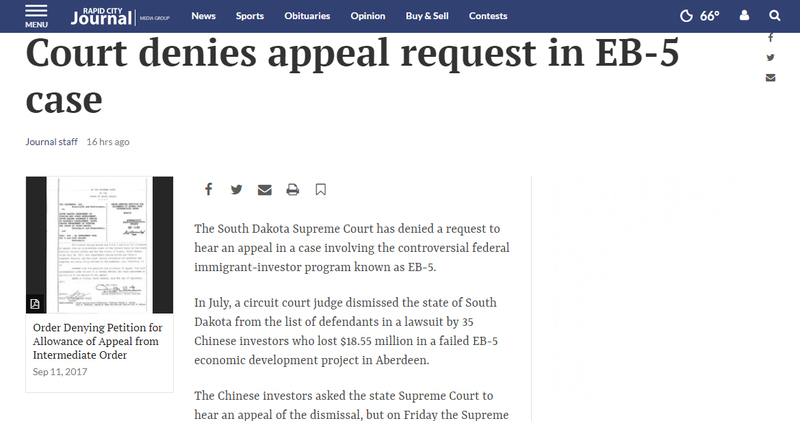 In July, a circuit court judge dismissed the state of South Dakota from the list of defendants in a lawsuit by 35 Chinese investors who lost $18.55 million in a failed EB-5 economic development project in Aberdeen. The Chinese investors asked the state Supreme Court to hear an appeal of the dismissal, but on Friday the Supreme Court denied the request to take up the appeal and offered no opinion on the appeal's merits. That means the lawsuit may continue at the circuit-court level without the state as a defendant. Remaining defendants include Joop Bollen of Aberdeen, who formerly managed the state’s immigrant-investor center under a contract with the state, and two of Bollen’s business entities.